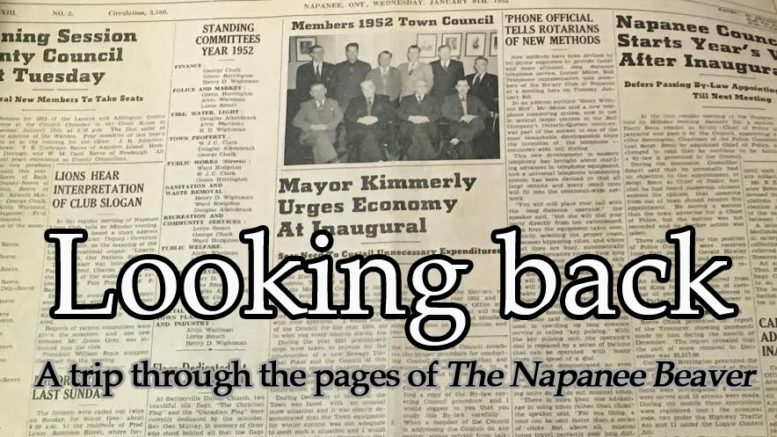 –At a special meeting, County council accepted a compromise on equalized assessment that would see Napanee accept an increase of $425,000 over 1938 levels compared to the $770,631 increase the Ontario Court of Appeal had set. Ernestown was the last municipality to sign off on the deal. It had been asked to assume $123,390 of additional assessment, but settled on paying $61,890 more.The balance of the cost was split between all of the other municipalities. -Ontario’s deputy agriculture minister W.R. Reek spoke at the Napanee Rotary Club’s farmers night. Reek encouraged farmers to spend more time considering how their products are placed before a consumer. He said middle men buying locally grown produce go to great lengths to earn a profit with no consideration for the producers. If producers could handle more of their sales, Reek said they might demand larger profit margins. -Three transients held in the Town Hall cells engaged in a lively fist fight after reportedly drinking throughout the day. One of the men was very badly beaten. One of the men was given an additional 35 days in jail, while another was given 21 days. No evidence was presented against the third man, presumably the one who lost the fight. -Lineups of 1,300 people formed at NDSS as early as 5:30 a.m. April 1 as Goodyear hopefuls vied to be first to hand in their job applications. Over a 12.5-hour day, more than 2,500 people had been through the school’s cafeteria on application day. Human resources manager Phil Brown said 80 per cent of the applicants came from within a 50-mile radius. Others came from as far away as Hamilton, Ottawa, and parts of Quebec. -After Pennsylvania authorities couldn’t reach a deal with Canada to return two young offenders from Napanee because they didn’t get assurances the boys would be kept under supervision or placed on probation, the boys were sentenced to ride a wagon train across the U.S. with other juvenile convicts and counsellors for one year completing work projects. The boys were found guilty of robbing a gas station near Harrisburg, PA in March. -Four anti-poverty advocates trekked into Odessa as part of a 370-km march from Ottawa to Queen’s Park. Two similar groups were marching from other parts of the province with the intention to meet in Toronto. Marcher Bill Thompson said the group was hoping to see welfare reforms enacted in the Province’s budget after the government took no action on a report on the subject four weeks earlier.